With the current brouhaha over the national debt and projected trillion dollar budget deficits, one side wants to cut spending to solve the problem, the other wants to raise taxes on the wealthy and on businesses. The tax raisers talk about cutting spending, and make a token effort to cut a little bit, but mostly they’re just talking. They don’t do spending cuts; they only want to raise taxes. Like many liberal solutions this one sounds good in the abstract. After all, when you want money, where better to get it than from those that have it? The notorious bank robber Willie Sutton apparently understood this. When asked why he robbed banks he is rumored to have answered, “Because that’s where the money is!” But he found there was a downside to going where the money was, spending about half of his adult life in prison. And like many liberal solutions to problems there is also a downside to going after wealthy Americans and businesses to satisfy the government’s obsessive spending, and we hear a lot less about the downsides to these solutions than we hear about the wonders they supposedly will produce. All jobs in the US are the result of activity in the private sector. Even government workers owe their jobs to American businesses, because without them there would be no one to tax to get the money to pay government employees. Every dollar taken from the private sector by government through taxation is a dollar that can’t be used to buy stuff. The more money people have the more goods and services they will buy. The more goods and services people want to buy, the more of them that have to be produced, and that is where jobs come from. Over-taxing the wealthy and businesses is in effect biting the hand that feeds you. The left is fond of finding someone or something it can portray as evil and greedy, and get people all riled up about it. One of the most popular of those is the oil industry. Conventional wisdom holds that the oil industry is one of the most profitable industries in the country, raking in billions of dollars each year, and it’s the greedy oil companies that control gasoline prices that are punishing Americans today. And since our leaders have spent us into a deep hole and want to spend even more, oil companies are a juicy target for additional tax revenue, and no one will complain if taxes are raised on oil companies. The highest earning industry group, beverage and tobacco products, makes more than three times the profit margin (21.7 percent) of oil companies (5.7 percent). 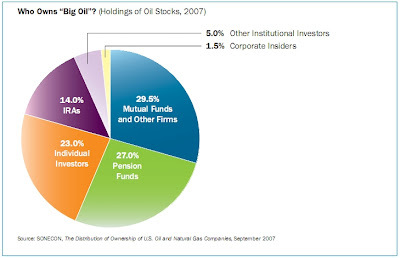 For every dollar of an oil company’s sales, after all expenses are paid the oil company has 5.7 cents left as profit. By no reasonable measure can that be called excessive profit. The oil industry makes tens of billions in profits because it spends hundreds of billions doing business. The oil industry spent well in excess of $250 billion just on capital projects in the U.S. in 2010, and more than $58 billion on new low-and-zero emissions technologies for carbon mitigation, which is 44 percent of all expenditures for that purpose. Market forces and government policies are responsible for raising gasoline prices, and higher gasoline prices only increase industry profits. While President Barack Obama and other liberal big spenders like to get folks all fired up about greedy “Big Oil” as a source for tax revenue, what he’s not telling you is that raising taxes on oil companies is raising taxes on you.